The weather was warm at about 12c which was fine for the end of the season. The river still low and clear which still suited the float fishing for chub approach. The wind from the previous day had calmed down a little. I arrived at about 1pm and settled in a swim on a large bend where there is a overhanging tree and a small slack under the far bank where the roots are. The chub normally hang around this area and a few people have had their pb’s from this swim. Certainly it has held chub over 5lbs. I was using the same 12ft float rod as it’s a little stiffer than the 15ft rod it helps preventing the chub from getting into the roots. And again there are overhead branches which make using a longer rod difficult. I adopted the same approach of feeding for 30 mins before casting out. The outcome was similar to the previous day in the other swim the first trot down gave me a 4lb chub which is a good start. I just have this feeling that the chub size will be increasing from this stretch as the barbel fishing is in decline because of the otter predation. Even Paddy is thinking that the barbel fishing particularly during the winter is not giving the returns it has done over previous seasons. It will be very interesting to see what barbel are present when they turn up on the shallows at spawning time. Time will tell I guess. I continued fishing and had 3more chub and a few roach of not great size before Paddy came along. He wanted to try the swim feeder rig I had been using on the Stour. So we spent 20 mins or so tying the rig then we moved down to a good chub swim. I stayed with Paddy for 30 mins or so and in that time he had a dace and a small chub of 1.5lbs. So he was catching which is good, although there were fewer bites than I thought he would get. Moving back to my swim I caught couple more 2lb chub. It was time for a move. 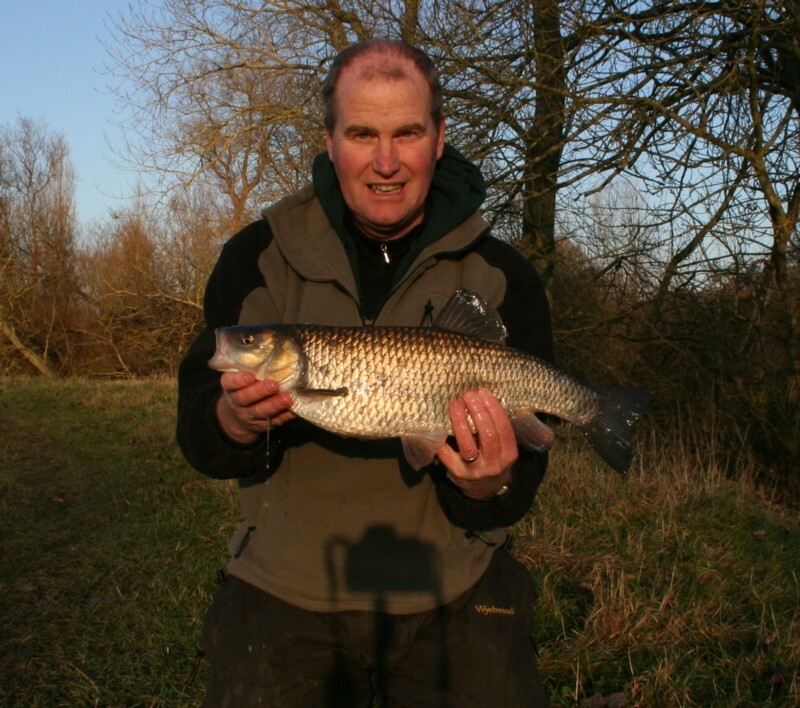 There is a fairly tight swim with a reasonable trotting line that has always produced chub for me in the past and only in January managed a 5lber from there, see photo below. Again the same approach was made with the feeding 30 minutes of catapulting maggots out to get them going. This time the with Paddy looking on and me feeling confident of catch it wasn’t to be the first trot through or the second, third or fourth. The fish where further down the swim and I caught a chub of about 1.5lbs then a dace and a roach. However each time a small fish was bought back upstream a pesky pike would make a lunge for them. It was ending with me skipping them up over the surface of the river to avoid the thing. Several times they only just made it. All too soon the evening gloom came along and it was getting difficult to see the float. So I called it a day and again not too bad 8 chub which two were about 4lb and some dace and roach. It was very interesting to note that the dace were very rough to the touch, this is the male fish getting ready to spawn. Mrs. Dace must like a bit of rough I guess. Paddy had caught a few dace and a chub, but the method hadn’t worked as well as the float. Paddy and me agreed to meet again on Monday afternoon for one last operation catching big chub. Bob the expert chub catcher would join us too. This entry was posted on Sunday, March 13th, 2011 at 1:40 pm	and is filed under Uncategorized. You can follow any responses to this entry through the RSS 2.0 feed. Both comments and pings are currently closed.